Apartment market performances tend to be holding solid in college towns across the Midwest, perhaps offering an under-the-radar investment opportunity. While the pattern registers across quite a few individual markets, Ann Arbor – home of the University of Michigan – provides a particularly striking example of the trend. 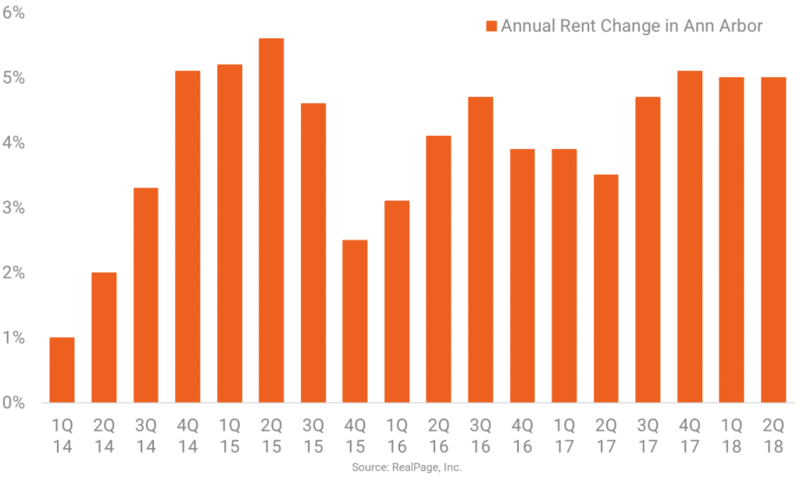 Annual rent growth for conventional apartment communities in Ann Arbor has averaged 4.0% since early 2014, with pricing as of mid-2018 up 5.0% from the year-earlier rate. Helping support rent growth in Ann Arbor, the market’s occupancy rate is high at 97.4%. Some building activity is seen in Ann Arbor, but the pace of construction doesn’t appear to have reached a magnitude that would derail occupancy or rent growth. Identified ongoing building totals about 500 units of conventional product and just over 1,200 beds of student housing. Adam Couch is a Market Analyst for RealPage, Inc. Prior to joining Realpage, Adam worked in the foreign exchange and futures industry where he focused specifically in capital markets. He graduated from the University of North Texas, where he studied finance and was a part of the Student Investment Group. Adam also has traveled extensively throughout China, where he studied international policy and its impact on macroeconomics.